At FEA we believe in creating and operating high-performance facilities that enable the mission of the overall organization and minimize the impact of buildings on the environment. Ensuring that facilities are operating at optimal levels is not only the right thing to do but the smart thing to do. In the past, analysis started with an operations audit. FEA has taken the maintenance audit to a whole new level: fmDiagnostics™. 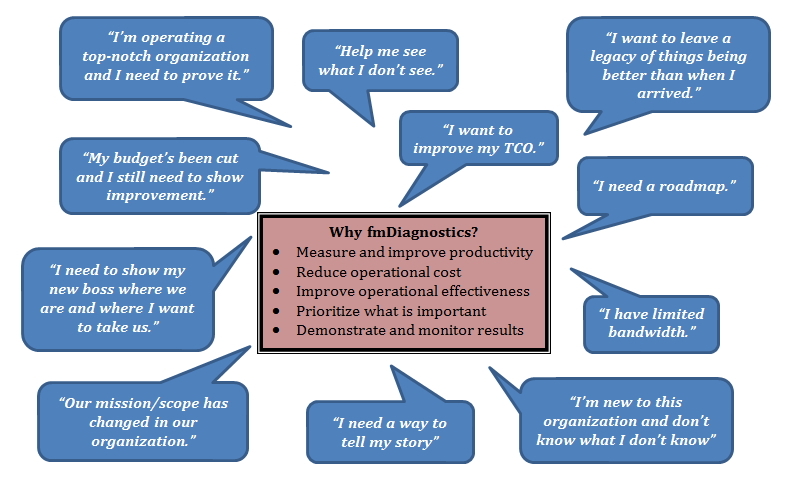 fmDiagnostics™ is a standardized facility management organization and process evaluation system. It is a truly comprehensive organizational and leadership diagnostic tool developed specifically to measure FM performance and create high-performance facilities organizations. It also provides a very cost-effective diagnostic tool and living database. fmDiagnostics™ systems approach is rooted in industry best practices, benchmarks, and standards published by the International Facility Management Association (IFMA), Association of Higher Education Facilities Officers (APPA), and the National Research Council/Federal Facilities Council. The leadership assessment utilizes the Balanced Score Card (BSC) developed at the Harvard Business School. The approach is designed in a Baldrige National Quality Program (BNQP) quality measurement system-based framework. Whether you manage government, healthcare, educational, R&D, manufacturing, or corporate facilities, fmDiagnostics™ has the flexibility to assess the specific organizational requirements of your industry. Just as individuals can benefit significantly from getting routine health check-ups, FM Diagnostics™ was developed to measure the health of a facilities organization. Much like standard human health predictors, such as weight, cholesterol, blood pressure, etc., fmDiagnostics™ uses a pre-defined set of operational indicators to measure the short- and long-term health of a facilities organization. fmDiagnostics™ integrates recognized quality standards for FM services with a repeatable and transparent scoring system which can be linked to Key Performance Indicators (KPIs) and aligned with the organization’s strategy. This paves the way for implementing improvements which are aligned with the mission and vision of the organization, and accurately measures the results. Our desired outcome is to help you “tell your story” to corporate real estate executives, agency directors, government leaders responsible for their built environment, institutional business officers, and corporate executives (C-Suite), and your own staff to obtain the resources and support you need. Please contact us at (703) 591-4855 with any questions.